It seems like all my favourite fruits and berries are in season right now. Breakfast almost everyday has been fresh fruit with yogurt, rice milk or milk and often with müsli. Usually I’m too groggy in the morning to care much about breakfast but at this time of year, especially since it’s so bright out so early, it’s hardly a chore. Strawberries, blueberries, cherries, nectarines or peaches are my summer standards. I usually choose two of them. 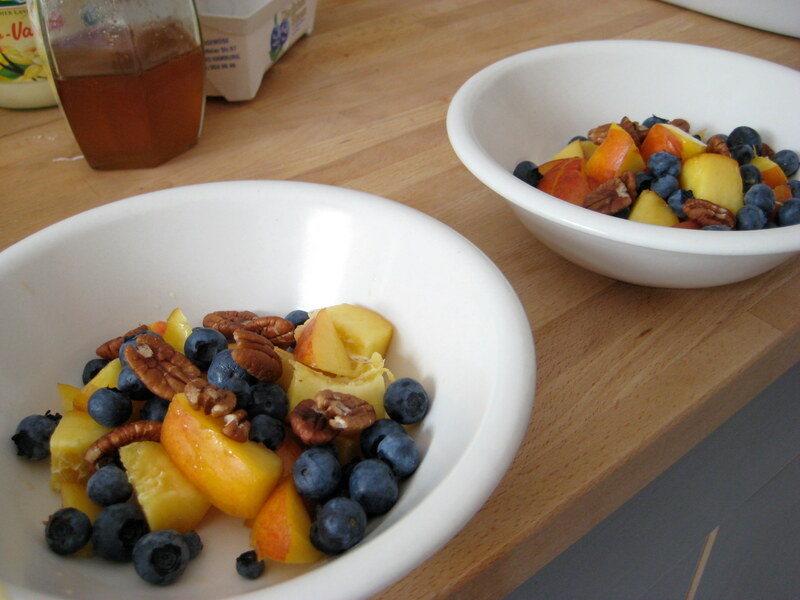 Sprinkle on some nuts, walnuts, pecans or almonds, whatever I have in the pantry, pour in some müsli although I like it without it as well, add some yogurt, plain or flavoured, or sometimes milk. I generally make a point of trying to get yogurt with active culture. Recently, I’ve really been enjoying müsli, a taste that I find comes and goes in phases. There are all sorts of müsli to choose from in Germany but right now I’m particulary enjoying “Der Klassiker” from Kölln. As for fruit, nectarines are my all time favourite, tart and juicy and more consistently delicious then the delicate peach, although I am enjoying the Bergpfirsich (Plattpfirsich or flat peach) that started popping up at the market a couple of years ago. It seems to me like it’s always easier to healthily in the summer, the fruits and vegetables are plentiful and my body isn’t trying to convince me that more fat is the way to go. When I start craving french fries again, I’ll know summer is over. If I’m lucky, that shouldn’t be for another couple of weeks.